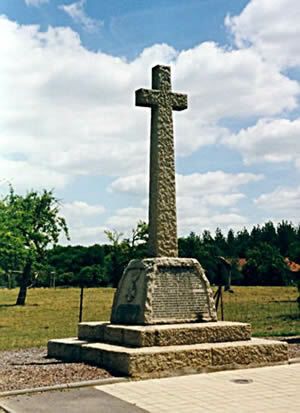 "On Sunday, November 6th 1921, General Berthelot, one time Commander of the French 5th Army, and at present Military Governor of Metz, unveiled the memorial that has been erected at the Bois des Buttes in memory of the soldiers of the 2nd Battalion of the Devon Regiment, who laid down their lives for their King and country on that fatal day - May 27th 1918*. TO THE LAST WITH AN UNHESITATING OBEDIENCE TO ORDERS. TO THE SACRED CAUSE OF THE ALLIES. In honour of this glorious action, the Second Battalion was decorated by France with the Croix de Guerre. It is the regiment's proudest possession. "In the name of the French Army, I express our admiration for the British troops who fought by our side during the war, who submitted cheerfully to all the hardships of the campaign and whose smiling men went to death and glory with heroic self-sacrifice. But in particular I wish to pay special tribute to the men of the Devonshire Regiment - men I knew during one of the severest fights of the war. This ground will ever be hallowed by reason of their heroism on May 27th 1918." *The battles which occurred when the Germans pushed the Allied Forces back across the Aisne to the Marne took place over a period of days at the end of May 1918 and in the aftermath of the fighting relatively few deaths can be pinpointed to an exact date. Many bodies were never recovered and for decades, remains have been discovered by farmers in the area. The memorial at Soissons records the death of 3882 identified men and states that some 4000 more have no known grave.